Traditionally, a lamp made out of rice flour mixed with jaggery, called ‘maavilakku’ (மாவிளக்கு) is lit on certain auspicious days such as Fridays of Aadi (ஆடி வெள்ளி), the fourth month of Tamil calendar and Thai (தை வெள்ளி), the tenth month of Tamil calendar. In some families, ‘maavilakku’ is lit on Saturdays of Purattasi (புரட்டாசி சனிக்கிழமை), the sixth month of Tamil calendar. Lighting ‘maavilakku’ is a method offering prayers to the Gods. My grandmother used to make ‘maavilakku’ with freshly ground raw rice flour, jaggery and cardamom. According to ‘sangam’ (சங்கம்) Tamil literature, foxtail millet (தினை) was used by ancient Tamils and is still used in villages for making ‘maavilakku mavu’ (மாவிளக்கு மாவு). Hence, I thought of making ‘maavilakku’ with foxtail millet flour and it came out well. Let me share the method with you. Foxtail millet flour is now easily available in most grocery stores. 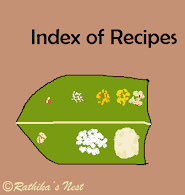 * Traditionally rice flour is used for making 'maavilakku'. Wash raw rice well with water and dry in the shade for 3-4 hours. Then grind the rice using the mixer-grinder into a fine powder. Pass through a sieve to remove any larger particles. You may use this freshly prepared rice flour instead of foxtail millet flour. Follow the same recipe and replace honey with clarified butter or ghee. Flatten the dough ball gently. Make depression in the center and expand it sideways without breaking the contour. Shape it like an oil lamp (Fig.2). Now place the ‘maavilakku’ on a plate. You may decorate it with kumkum (குங்குமம்) on the sides. Pour 1-2 teaspoons of ghee in the depression and dip a cotton wick (பஞ்சு திரி) in the ghee. Bring the tip of the wick out over the edge of the depression. Light the lamp and offer your prayers (Fig.3). Once the ghee is fully used up, put off the flame of the 'maavilakku' or flour lamp, and remove the wick. You may now serve the 'maavilakku maavu' as 'prasad' or as a dessert.